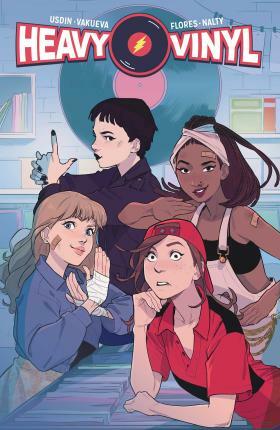 When Chris joins the staff at her local record store, she's surprised to find out that her co-workers share a secret: they're all members of a secret fight club that take on the patriarchy and fight crime! Starry-eyed Chris has just started the dream job every outcast kid in town wants: working at Vinyl Mayhem. It's as rad as she imagined; her boss is BOSS, her co-workers spend their time arguing over music, pushing against the patriarchy, and endlessly trying to form a band. When Rosie Riot, the staff's favorite singer, mysteriously vanishes the night before her band's show, Chris discovers her co-workers are doing more than just sorting vinyl . . . Her local indie record store is also a front for a teen girl vigilante fight club! Follow writer Carly Usdin (director of Suicide Kale) and artist Nina Vakueva (Lilith's World) into the Hi-Fi Fight Club, wher they deliver a rock and roll tale of intrigue and boundless friendship.